Belcorp International, a beauty products juggernaught with 800,000 beauty consultants in 15 countries, set out to open its U.S. headquarters in San Francisco. Chairman Eduardo Belmont oversaw the project, including space for himself and executive team. Belcorp’s U.S. General Manager, Maria Montoya, found us from New York City after seeking referrals and getting positive feedback from our previous past clients. Additionally, our collection of tenant-centric articles and tips gave her the confidence to pick The Space Place as her exclusive broker. The U.S. HQ needed to be in a central Class A, CBD location. A tight schedule tied to the rollout of a new American product line, “L’Bel” made everything urgent. So we quickly assembled a Team of professionals to assist us in handling every aspect of the deal: Architect, contractor, furniture consultant, IT consultant, real estate counsel, and move-coordinators. The HQ space would be a special place – very special space. Our team interviewed Belcorp to confirm their spatial requirements, budget, timeline and geographic preferences. Being central to public transportation and in a safe environment was critical. 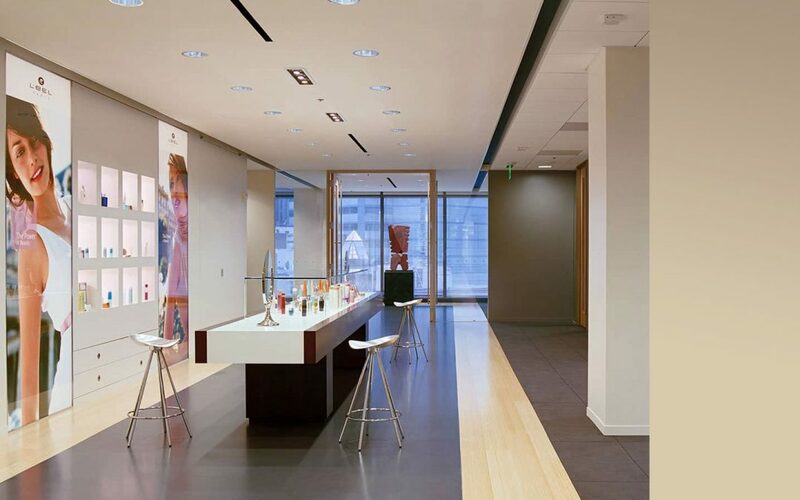 In short order, we focused on just a few sites, including Hines’ 101 California Street which offered multiple suitable spaces. The question was, should we focus on the 8th floor, with very pleasant cityscapes and a view of the people on the street? Or consider paying a $25/sf/year premium to be up beyond the 40th floor? Extra care was required to get local owners comfortable with the creditworthiness of a foreign entity. Our due diligence process was successful – landing 13,000 sf on the 8th floor of 101 Cal, plus outdoor deck space, with extremely compelling economics and full waiver of security deposit. The 7-year transaction closed at an average of $31/sf/year (fully serviced), including $50/sf in tenant improvement contributions from Hines. Belcorp’s space was custom designed, constructed and furnished in world class manner (see photos). They were so inspired by their new environment, Belcorp retained Fennie + Mehl Architects to custom design the interior of a high-end bus – to become Belcorp’s first mobile spa. Belcorp’s international success exuded from the top – from Eduardo Belmont – whose energetic and well-financed team inspired us to do great work for them. Their entire crew was a joy to work with. We achieved all their dreams for a fabulous and economically sound U.S. headquarters space – at $25/sf/year less than the people who leased space upstairs! Read what Belcorp has to say about our work.